The funny part is that I used one of the Bottle Up dies (the smaller of the tall bottles) to create my little minion. The bottom of the bottle is just the right shape:) To create the goggles/eyes, I used the circle dies from the Custom Panels dies set. I double cut some silver metallic card stock to make the open circles for the goggles. I used some black enamel dots for his eyes:) His mouth was cut by hand but you could also use a thick marker. I just realized I never gave my little guy some hair! 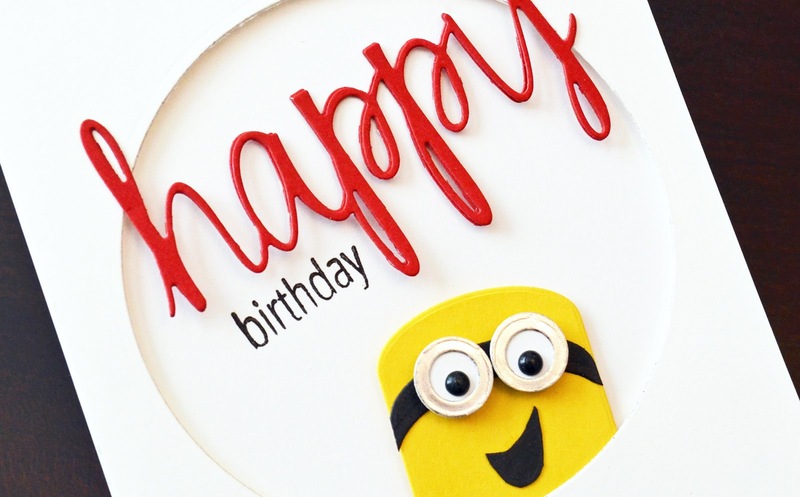 I'll have to draw those in later:) My kids are a little too old for this card, but I know a certain preschooler with a birthday coming up and I hope she loves her little minion! Dude. Best. Card. Ever. Seriously. I am so head over heals in love with this thing, I can't even TELL YOU!!!! It's amazeballs. Completely and utterly amazeballs. Speechless. And oh, so very happy after looking at this card!!!! You are amazing, JJ! This is adorbs!!! My kids would love it, too! Oh this is just so adorable!! Love it! LOVE, LOVE, LOVE! You are so dang clever, JJ! Your card is so cute. You are so clever, JJ. How clever is this? I love it!! This card is so cute!! LOVE that song and that movie!!! Totally genius! I LOVE this and it is sure to be a huge hit! Fantastic card JJ! You are so creative!! I always enjoy seeing what you come up with!!! AMAZING card...laughed right out loud when I saw it. Someone's going to be a lucky recepient. My son sang that song for his Kindergarten grad...this card does make you feel happy! What a fun creative card JJ! 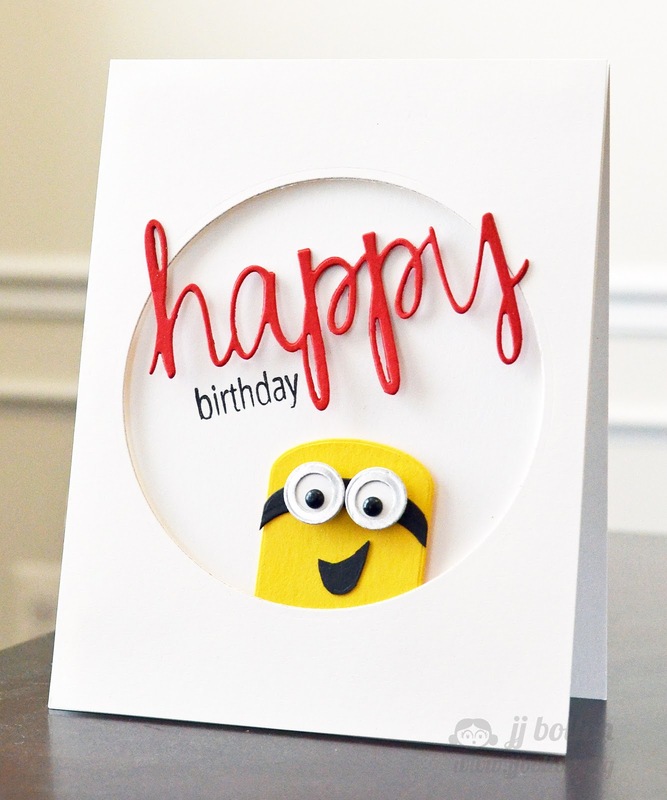 DH and I LOVE the minions - so I'll be case'ing this creation for sure! What an adorable card and so creative. Who doesn't love a minion or the song, "Happy"?!!? very , clever, nice job!...love it.